Even after six months on the job, there are quite a few things that President Trump doesn’t seem to grasp about the United States’ political system, from the idea that his policies are subject to judicial review to how exactly the Republican health-care plan works. Trump’s interactions with James Comey, and the FBI director’s subsequent firing, made it abundantly clear that the independence of the Justice Department belongs somewhere near the top of that list. While he now has a team of lawyers to break down matters related to the Russia probe, in an interview with the New York Times on Wednesday, Trump demonstrated that he still doesn’t comprehend some key facts about what got him here. While the Justice Department is part of the executive branch, as Politico explains, over the past few decades a series of directives issued by Justice Department officials were put in place to ensure that federal investigations are free from political interference. Trump can fire the FBI director, but he’s not supposed to ask for his personal loyalty — and he’s certainly not supposed to publicly suggest he fired the director because he doesn’t like the probe into his Russia ties. Presumably, someone went over this point with Trump, as it’s raised the possibility that he’s guilty of obstruction of justice. Yet, in the Times interview, Trump suggests that he expected Sessions to manage the Russia probe for him when he made him attorney general. Trump’s complaint that Sessions “should have told me [he’d recuse himself] before he took the job” doesn’t make sense, as the Washington Post points out. Sessions’s two-day Senate confirmation hearing largely focused on whether he’d be able to uphold the law in an impartial manner, despite his close relationship with Trump. 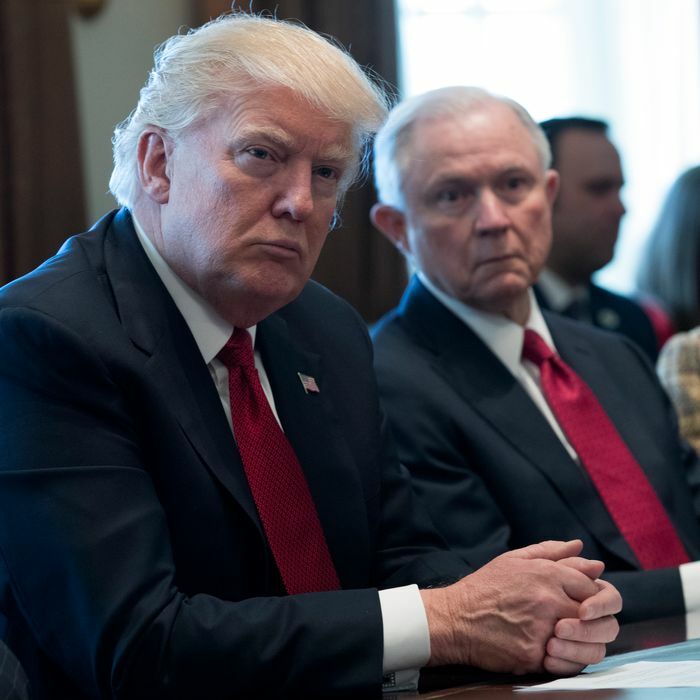 In addition to lashing out at Sessions on Wednesday, Trump went after nearly every other Justice Department official involved in the Russia probe. He complained that Sessions’s recusal put the Russia investigation under the jurisdiction of Deputy Attorney General Rod Rosenstein, who worked as a federal prosecutor in Baltimore. “There are very few Republicans in Baltimore, if any,” he complained. Trump seems to be implying that Rosenstein appointed Special Counsel Robert Mueller because he’s a Democrat, but Rosenstein actually grew up in Pennsylvania and his political affiliation is unknown. Trump also continued his unwise habit of making vague threats against those involved in the Russia probe, such as when he threatened to release tapes of his discussions with Comey (though they don’t exist). Trump told the Times that he interviewed Mueller to replace Comey just one day before he was appointed special counsel. TRUMP: … Really, pleasantries more than anything else. It was not a long conversation, but it was, you know, could be 15 minutes. Just talked about — things. Actually, it was very interesting, we talked about adoption … We talked about Russian adoption. Yeah. I always found that interesting. Because, you know, he ended that years ago. And I actually talked about Russian adoption with him, which is interesting because it was a part of the conversation that Don [Jr., Mr. Trump’s son] had in that meeting. Putin ended the adoption of Russian children by Americans in response to the Magnitsky Act, a 2012 U.S. law that punished Russian officials for human rights abuses. So talking adoptions with Putin is actually talking sanctions with Putin. It’s a bit odd for Trump to tie his talk with Putin to the uproar over his son’s emails, but it seems he’s unclear on the implications of Don Jr. eagerly taking a meeting related to Russia’s attempts to influence the U.S. election. As Trump explained, he’s heard about the email exchange, but he hasn’t bothered to look at it very closely. If Trump was going to recuse himself from taking any of his legal team’s advice, he should have told them before they took the job.